Localization is the process of adapting software to meet the requirements of local markets and different languages. If the CurrentUICulture is set—from code or web.config—Telerik UI for ASP.NET MVC will use localized user interface messages. Telerik UI for ASP.NET MVC comes with localized messages for the cultures listed in the table below. If the CurrentUICulture is not supported, the default en-US will be used. The culture used for the localization messages is determined by the CurrentUICulture and not by the CurrentCulture property. Telerik UI for ASP.NET MVC uses satellite assemblies to support localization (user interface messages localized for a set of cultures). To change the provided localization messages, a custom version of Kendo.Mvc.dll must be built. This is required because Kendo.Mvc.dll is a strongly named assembly and its private key is not shipped as part of the Telerik UI for ASP.NET MVC distribution. Below are listed the steps for you to follow when willing to change the provided localization messages. 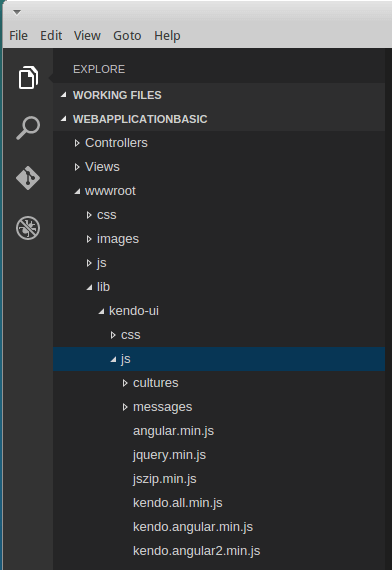 Open the \src\Kendo.Mvc\Kendo.Mvc.csproj Visual Studio project. The \src directory is available only with the commercial version of Telerik UI for ASP.NET MVC. Locate the Resources directory in the solution explorer. It contains the resource files for the supported cultures. Open the resource file which corresponds to the target culture, e.g. Messages.es-ES.resx. Edit the resource file and save it. Change the solution configuration to Release. Copy \src\Kendo.Mvc\bin\Release\Kendo.Mvc.dll and \src\Kendo.Mvc\bin\Release\es-ES\Kendo.Mvc.resources.dll to your ASP.NET MVC application. Update the Kendo.Mvc.dll assembly reference to the newly copied one. Apart from building a custom version of Kendo.Mvc.dll, you can specify a new value for the corresponding message in the MVC HtmlHelper configuration. For example, change the default message for the create Grid toolbar command as demonstrated below. To add a localization for a new language, a custom version of Kendo.Mvc.dll must be built. This is required because Kendo.Mvc.dll is a strongly named assembly and its private key is not shipped as part of the Telerik UI for ASP.NET MVC distribution. Below are listed the steps for you to follow when you want to add new localizations. Copy Messages.resx and paste it. Rename the copy to Messages.culture-code.resx, e.g. Messages.es-MX.resx. Open the newly created resource file. Edit the resource file and save it. The Messagex.resx file contains the English messages. Copy \src\Kendo.Mvc\bin\Release\Kendo.Mvc.dll and \src\Kendo.Mvc\bin\Release\es-MX\Kendo.Mvc.resources.dll to your ASP.NET MVC application.